Sulfoquinovose is a sugar found in plants, which contains sulfur. As a constituent of green-vegetable diets, for example in spinach and salad, it is also found in the human intestinal system – an environment without oxygen – and therefore doctoral researcher Anna Burrichter wanted to answer the following question: What happens when anaerobic bacteria degrade sulfoquinovose in the absence of oxygen? She discovered a new type of metabolism that transforms sulfoquinovose into hydrogen sulfide (H2S). So far, these results have been obtained from a laboratory model system. In future studies, the researchers will have to examine whether sulfoquinovose in the intestine is indeed metabolized to hydrogen sulfide, which is a toxic compound for humans. The study was conducted by the research team of Dr David Schleheck, and the results have been published in the current issue of the journal Frontiers in Microbiology. 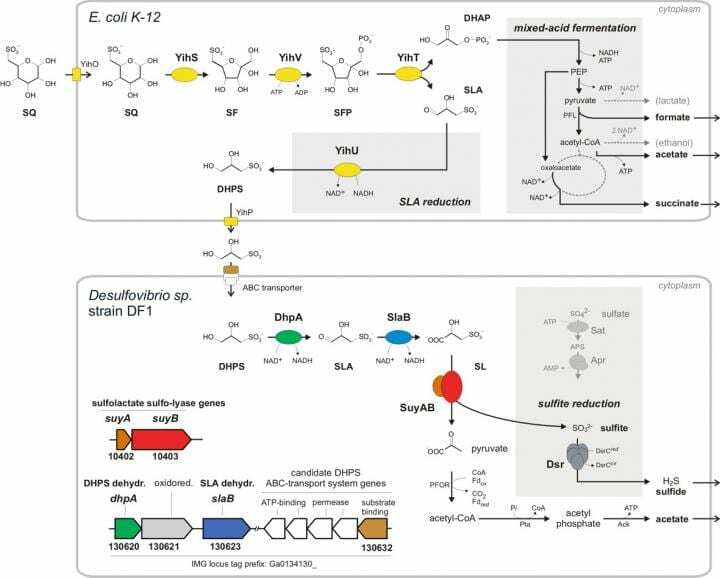 Anna Burrichter succeeded in discovering an entirely novel bacterial degradation pathway that involves three individual discoveries: the discovery of a new link in the biological sulfur cycle, the discovery of a new type of fermentation in Escherichia coli, the best-studied model organism that was also used in this study, and the discovery of a so far unknown energy metabolism in sufite-respiring bacteria, in the Desulfovibrio species. “Without oxygen, the degradation pathways are completely different. In the context of sulfoquinovose, we discovered a novel type of fermentation in Escherichia coli” says Anna Burrichter. Along with the sulfur-containing degradation product that is formed in this first degradation step, dihydroxypropane sulfonate, the researchers found a second bacterium, Desulfovibrio, which can utilize this intermediate for anaerobic respiration, the so-called sulfite reduction. This type of respiration with the organically-bound sulfur as electron acceptor instead of oxygen is described in detail for the first time in Anna Burrichter’s thesis. “We thought that hydrogen sulfide may be the end product, but it had never been proven before, and no one knew which bacteria and enzymes may catalyse these reactions”, the biologist says. The picture shows the degradation of sulfoquinovose (SQ) by Escherichia coli to a sulfur-containing intermediate (DHPS), which is excreted. Another bacterium, Desulfovibrio, utilizes this intermediate for anaerobic respiration and produces toxic hydrogen sulfide (H2S).